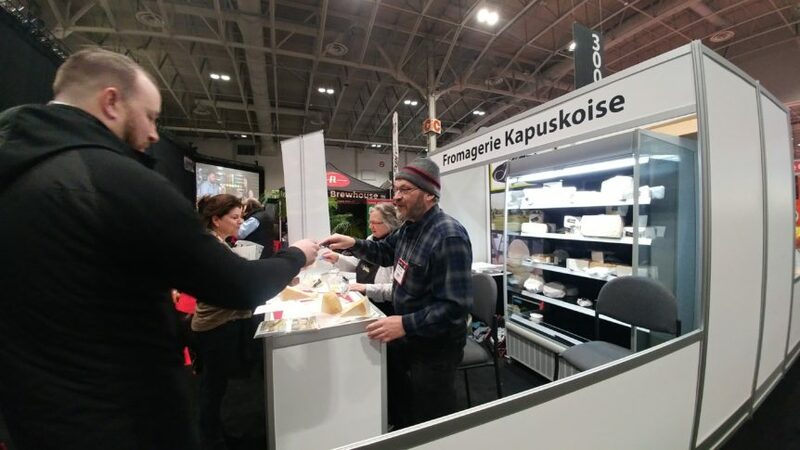 In 2017-18, the Rural Agri-Innovation Network (RAIN), a division of SSM Innovation Centre, and Northern Ontario Farm Innovation Alliance (NOFIA) formed a partnership to organize a delegation of northern Ontario businesses to attend the Restaurants Canada Trade Show 2018. The purpose of the delegation was for northern Ontario agri-food businesses to have increased opportunity to expand their businesses through building relationships with other businesses in the agri-food value chain. The RC Show is Canada’s largest foodservice trade event that happens annually at Exhibition Place (Enercare Centre) in Toronto, ON. The eight businesses that participated included: Algoma Highlands Wild Blueberry Farm (Algoma), Bay Meats Butcher Shop (Thunder Bay), Belly Artisan Ice Cream (Muskoka), Fromagerie Kapuskoise (Cochrane), Penokean Hills Farms (Algoma), Purvis Fisheries (Manitoulin), Quinta Quinoa (Nipissing) and Thornloe Cheese (Temiskaming). RAIN assisted businesses with assessing their needs and liaising with RC Show staff and service providers. Partners assisted six of these businesses with creating print materials, which included brochures, banner ups, recipe cards and business cards for the event. The RC Show was steadily busy for businesses to make connections with the industry. There were some opportunities for product placement including having Quinta Quinoa featured at the Garland Canada Culinary Competition. Vikram Vij of Dragon’s Den stopped by to show his support for Quinta as one of their investors. The Taste Northern Ontario delegation to the RC Show was deemed as a success from the participating businesses. Over 423 contacts were made by the businesses, which has already resulted in $376,500 sales to date (an average of $47,000 per business). On average each business made 53 contacts, and followed up with 45% of them. Businesses will follow up with 24% of additional contacts made later this year. Businesses project that they will have an increase of $656,400 in 2018 sales because of participating (an average of $94,000 per business). One business said that this event helped them create new distribution lines that will increase their reach to all of Canada. When asked about job creation, the businesses said that they expect to hire approximately 7 FTE positions because of the increased sales. Additional advertising for businesses at the event.